Fante Bukowski is funny and profane, a great send-up of a pretentious 23-year-old who quit his daddy's law firm to move into a cheap hotel, drink heavily, pick up women, and become a writer. However, he is more interested in living the writerly life than actually improving on his craft. Ungifted by talent and armed with a pen name portmanteau of his two favorite authors, he attempts to navigate the world of publishing, poetry readings, and being a literary genius while bumming checks from his mom. The fruits of his struggle are pretty hilarious. The first time I read this relatively short book, I was incredulous. The second time through, I was frequently tickled at the multiple disastrous forays into serious literature. In part I was amused to see a Holden Caulfield-style parody in action, all full of rage toward the "jocks" of the world but ultimately clueless. That dude is a total jock, I am sure. Such a figure is pretty low hanging fruit, and it is difficult for me to say that he goes through any real growth or change (though the ending sort of points to perhaps the next step in his evolution). Ultimately I still found I really enjoyed this book because of its situational comedy and the actual "literary pieces," which are most enjoyable in and of themselves. They are fun to read, and I bet they were a hoot to make up as well. 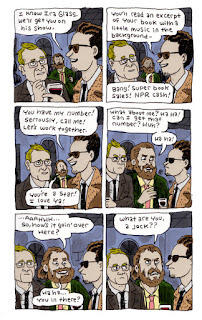 Overall, I loved the send up of an overblown literary scene, replete with conniving agents, hangers-on, and the obligatory Dave Eggers cameo. 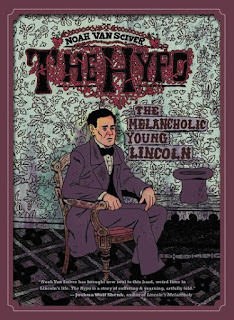 This biting lampoon is the product of Noah Van Sciver, author of the graphic novels The Hypo: The Melancholic Young Lincoln and Saint Cole. 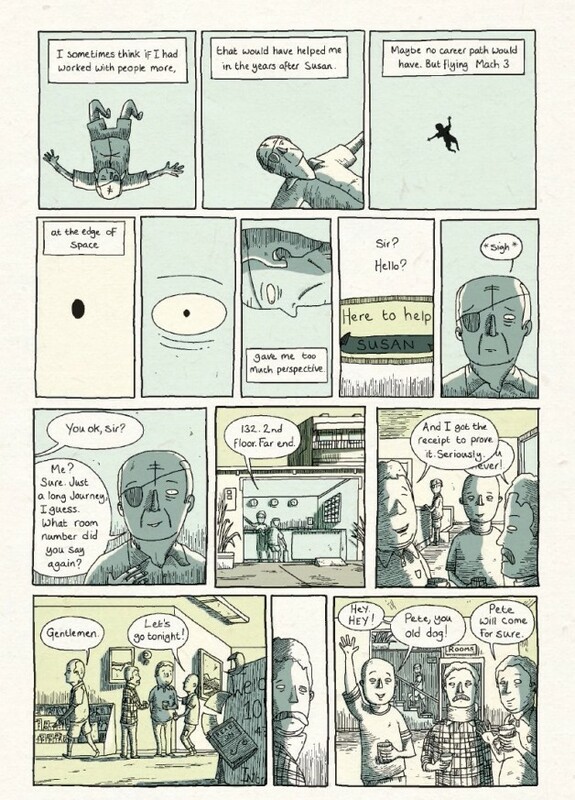 He is also known for his many mini-comics (some collected here) and the series Blammo. He also has a Tumblr page where he first posted episodes of Fante Bukoswki. 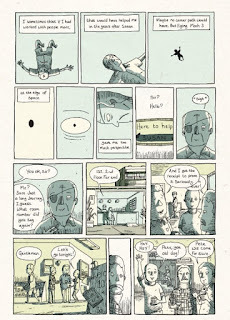 He speaks about the book in this interview and more about his various works in this Comics Alternative Interview (Hi, Andy!). All the reviews I have read of this book have been positive. 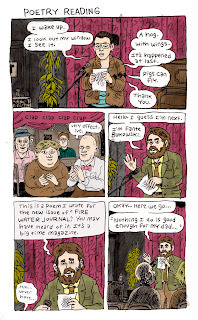 Spencer Hicks called "a complicated and very funny new comic." Benn Ray called it "an excellent study in the self-deluding nature of artists and an immediate Van Sciver classic." Tom Murphy praised Van Sciver for "delivering caustic satire while still maintaining a degree of empathy for its flawed characters." 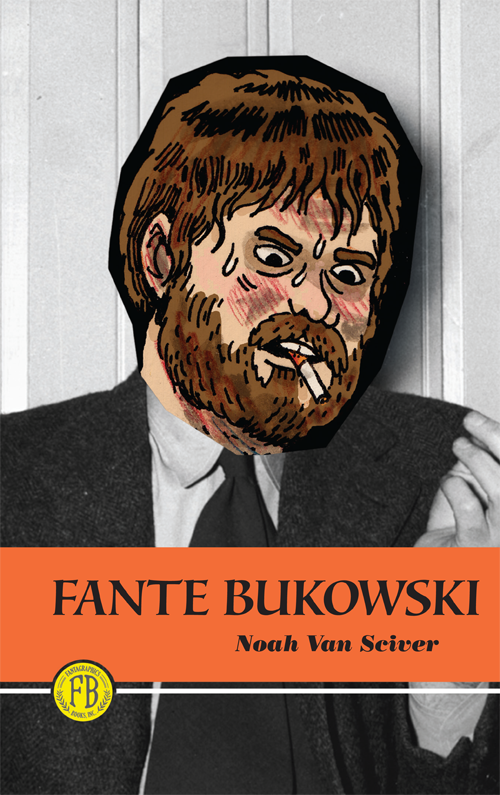 Fante Bukowski was published by Fantagraphics, and they have a preview and much more available here. Because of the language and sexual situations, I suggest this book for readers mature enough to handle both. 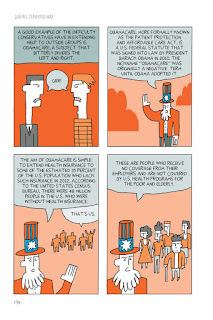 The Age of Selfishness is one of those books that makes me blanch that these things are called graphic "novels." 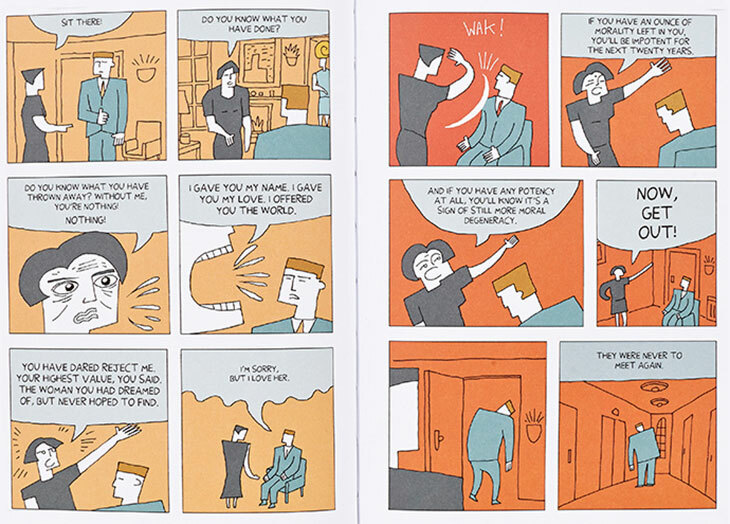 This book is more of a graphic essay, told in three parts. 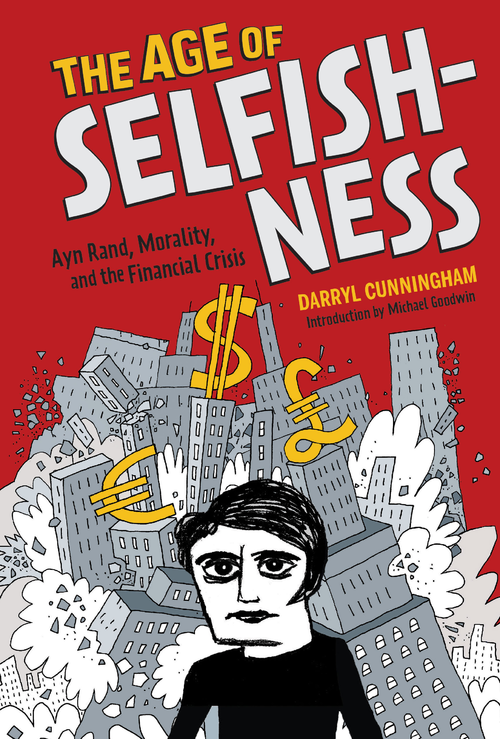 The first is about Ayn Rand, a novelist who began a cultish group that resulted in the pseudo-philosophy called Objectivism where extreme selfishness is considered a virtue. Her life, which began in Russia, was marked by much heartbreak and some convoluted romantic situations. The author clearly has his take on her life, but much of what he posits seems firmly entrenched in facts. 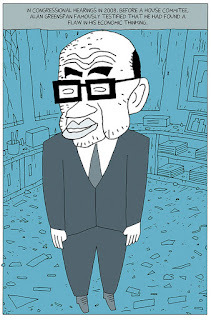 The second section of the book is about how the world arrived at the great economic crash of 2008, with a look at finance, banks, mortgages, and a few key individuals, including Alan Greenspan, a long-standing Rand acolyte. The third part looks at today's world by way of talking about libertarianism, conservatism, and liberalism. This book is certainly slanted in a particular point of view, but it is also well argued with much research and compelling facts, and it attempts to capture the pluses and minuses of these different political stances. This book tackles much in terms of its content and arguments, and it could been have pretty dense. Some passages are require revisiting because of the complex concepts they cover, but overall the simple, clear illustrations make most concepts much more understandable. What is discussed here affects our world, and certainly will have an impact on the immediate future, and regardless of your political leanings I feel that this book is pretty much a "must-read." Author/illustrator Darryl Cunningham specializes in nonfiction comics, tackling diverse topics in his blog Darryl Cunningham Investigates. He has also published two other graphic novels, one a collection of his experiences as a health care assistant in a psychiatric facility and the other about science denial. He speaks more about his work on this book in this interview. All the reviews I have read about this book have been positive. Publishers Weekly gave it a starred review. John Yohe called it "a fascinating read" that "gives a really big picture of American (and British) economic history." Carla Sinclair called it "a well-researched, detail-packed book that I’ll need to read a few more times to fully digest." 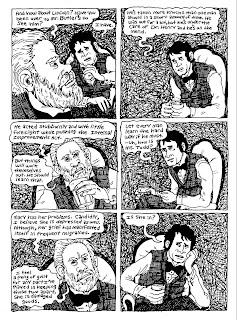 Andy and Derek from Comics Alternative found a lot of good in the book but wondered if it tried too hard to be balanced or if the arguments were consistent through the whole essay. Robert Kirby added, "This would be a challenging narrative to illustrate (hey, you try visualizing concepts like CDCs and derivatives), but Cunningham generally handles it with ease, clarifying complex financial terms and systems in easily comprehended visual language. 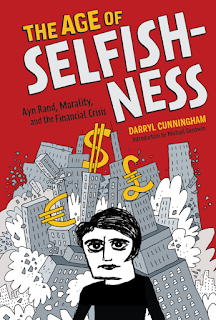 The Age of Selfishness was published by Abrams Books, and they have a preview and more here. to his complex relationships to the political figures of the times. It even contains a number of his original letters and poetry, and it is obviously well researched and executed. Perhaps what is most impressive about this book is that it humanizes this typically romanticized man. He is shown in moments of sickness and weakness, when he was caught up in spells of mental illness and anxiety, what he called "the hypo." He stumbles through social events and struggles in his business dealings and political aspirations, but he maintains an air of dignity, speaking with wit and perspicuity. The verbal interactions are half of what make this book exceptional. 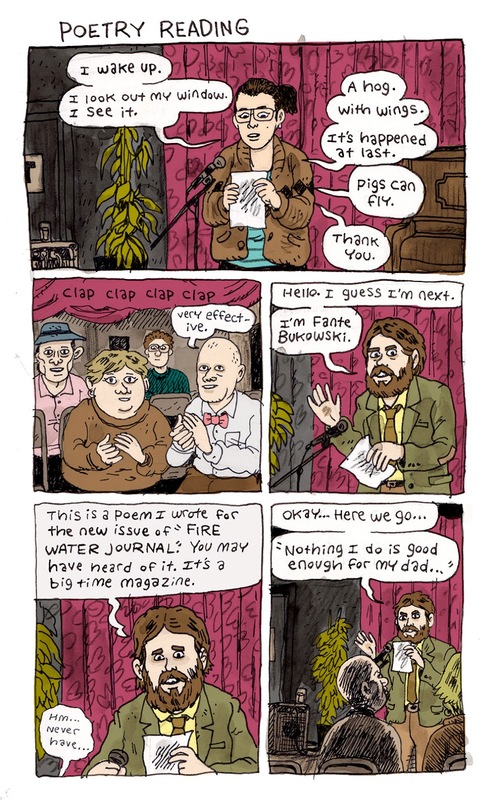 The other half contributing to this excellence is the artwork by Noah Van Sciver. 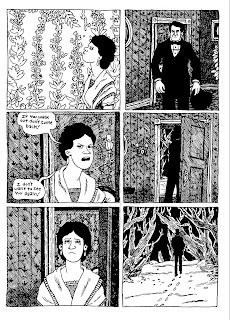 The black and white images and use of crosshatching lend a historical bent to the proceedings, which is only enhanced with his fluid storytelling and expert character work. 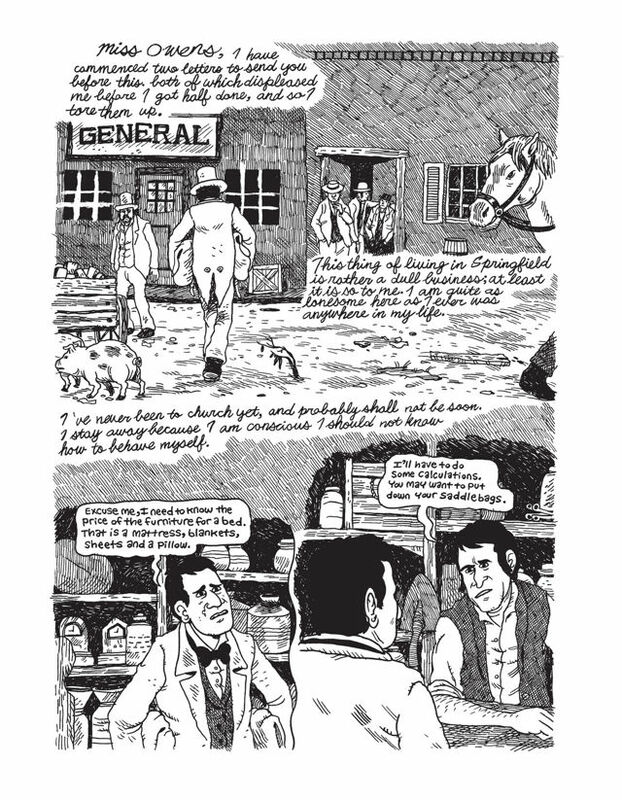 This book was Van Sciver's graphic novel debut, and an impressive one, but he is also known for his many mini-comics (some collected here) and the series Blammo. 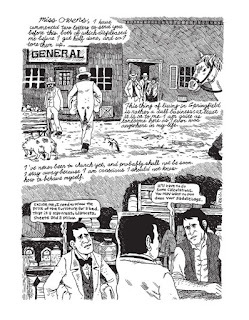 Van Sciver speaks at length about his work on this volume in this interview. The Hypo was named to many "best of" lists when it was released, and it has been very well reviewed. 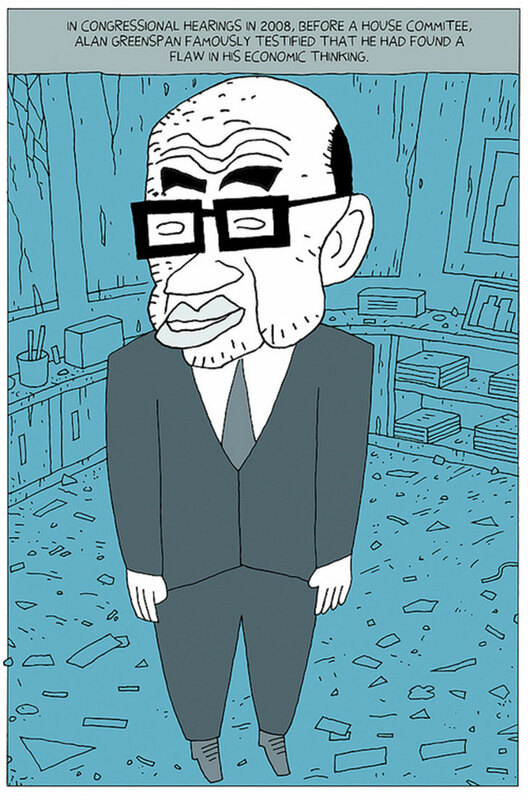 Glen Weldon called it "achingly familiar, relatably human and — most of all — profoundly real." The reviewer at ConSequential called it a "fresh, charming" introduction to Lincoln's melancholy and added that is also an "endearing, engaging and an all-round good read." Publishers Weekly gave it a starred review that concluded, "A thoroughly engaging graphic novel that seamlessly balances investigation and imagination." The Hypo was published by Fantagraphics Books, and they provide a preview and much more information here. Stereotypes that video games are for boys prevail even though statistics indicate that about half of all gamers are female. In addition, eruptions such as Gamergate show that in many ways female gamers are sometimes the target of misogynist agendas. 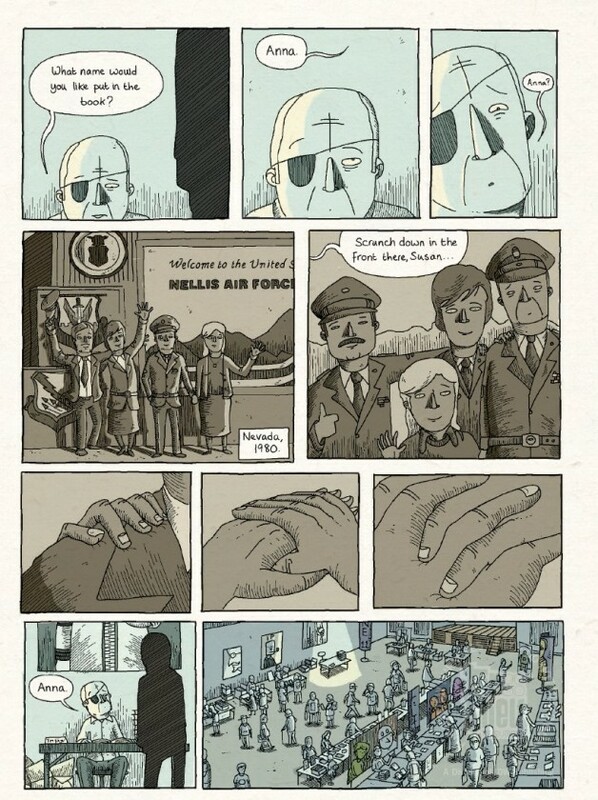 Even though such ugliness is not overtly referenced here, it is in the background of this graphic novel, In Real Life. 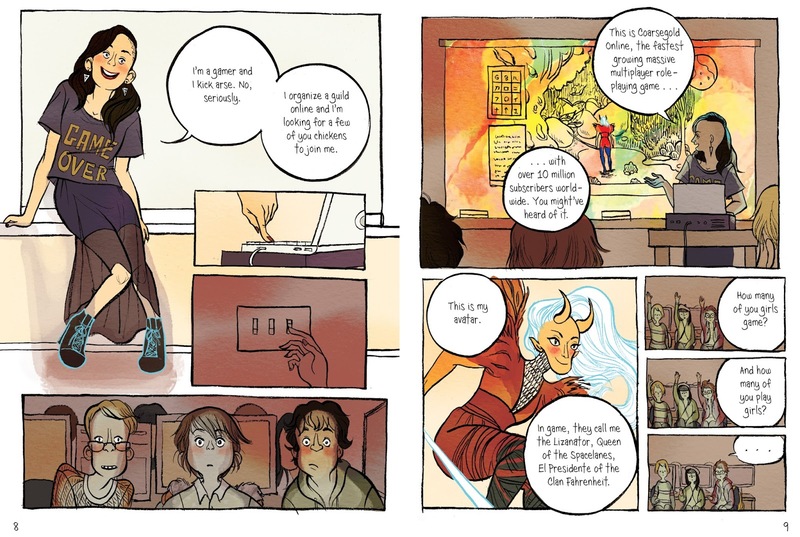 The protagonist here is Anda, a teenaged D&D fan who is inspired by a guest speaker at school to try playing a MMORPG. Playing the fictional game Coarsegold Online, Anda finds a niche she enjoys. She quickly masters game-play, makes friends, and levels her character (Kalidestroyer) up. Also, she joins a clique of video game activists who seek to root out the farming that is happening in the game. Anda likes the camaraderie that comes with joining this group and also enjoys the sensation of making this world a more equitable place while also making some actual money when she gets paid for completing these missions. This real life reward makes her parents suspicious of what she is doing online, but there are other consequences when she befriends one of the farmers, a Chinese boy named Raymond who supports himself by farming. Not only does this friendship complicate Anda's worldview, it also has a massive impact on Raymond's life when he takes Anda's advice and tries to get his fellow workers to demand improvements in their working conditions. I do not want to spoil the ending, but I did think it was a bit pat, that things did resolve perhaps a little too neatly. Still, I felt that overall this was a worthwhile book that highlighted the ways that consumerism, gender, fiction, and business intersect in complicated ways. 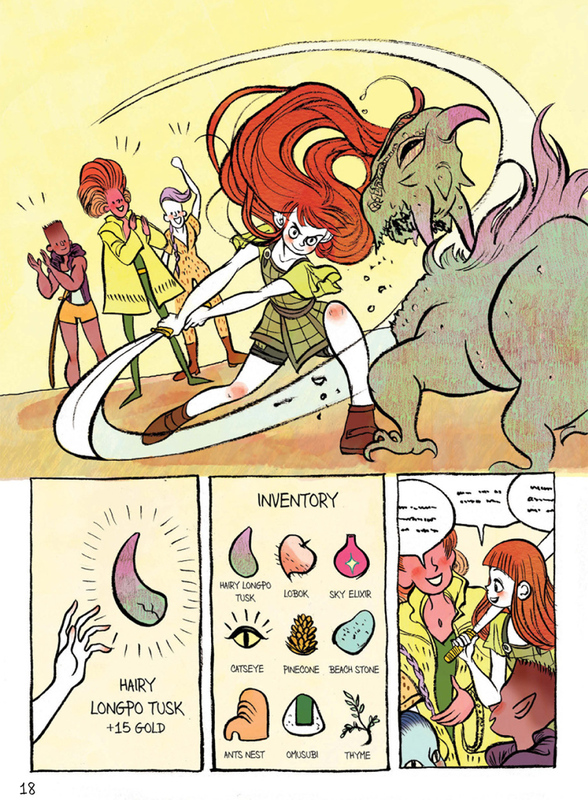 This ambitious and beautifully drawn book is a collaboration between Cory Doctorow and Jen Wang. Doctorow is an award winning author of multiple YA books, including Little Brother and Homeland, a blogger, and the co-editor of Boing Boing. 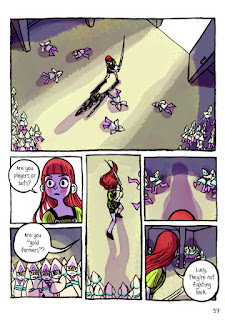 Wang is an artist and illustrator, and her debut graphic novel was Koko Be Good. 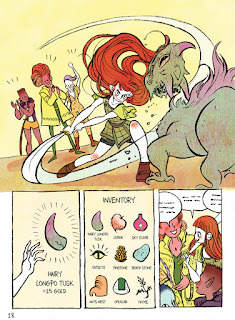 I love her artwork, with its flowing lines, cool pastel colors, emotive characters, and fun energy. Both creators speak about their work on In Real Life in this interview. All of the reviews I have read about this book lean to the positive. Chris Taylor offered his opinion that "they’ve shoehorned rather too much into the story for this to be entirely effective," but added that it "is a powerful narrative nonetheless." 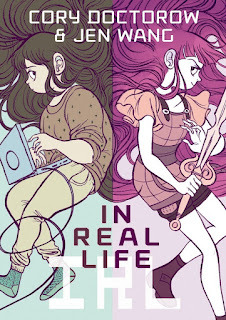 Kelly Thompson summed up that it was "a socially relevant, heartfelt and emotionally engaging story about a female gamer that will likely inspire and encourage generations of awesome girls." Jonah Gregory wrote, "It’s an enjoyable read and the messages it wants to convey aren’t so heavy handed as to be distracting." 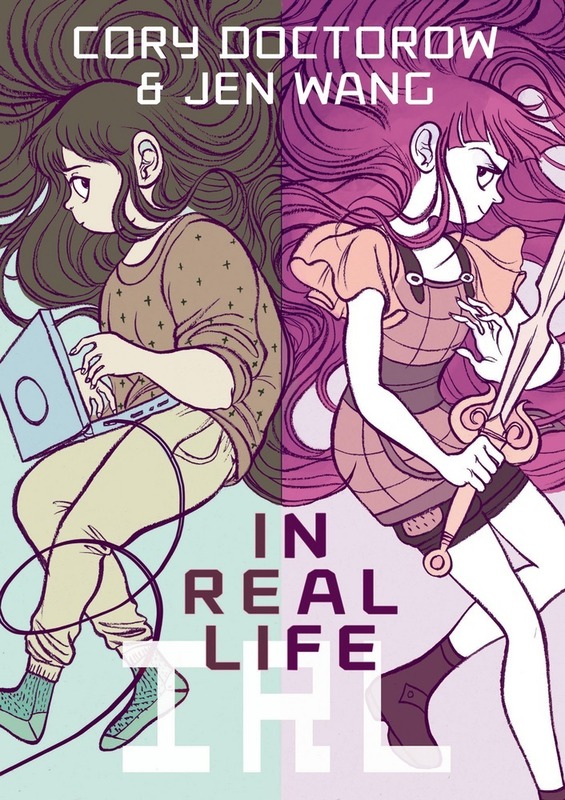 In Real Life was published by First Second, who provides a preview and much more here. 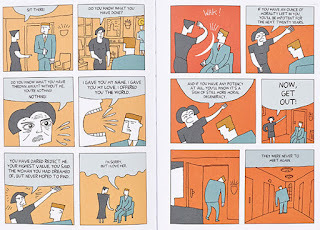 I think if there is any question that we are living in a great age for graphic novels, Tim Ginger would settle it. This beautiful, spare, idiosyncratic book is unlike other graphic novels I have read, with a pretty singular subject and wonderful execution. It focuses on the life of an ex-test pilot living out in the desert after being widowed. He leaves this sanctuary to go on a book signing tour where he encounters a persistent conspiracy theorist who keeps asking him questions and an old friend who brings back lots of buried feelings and remorse. All of these interactions are prelude to contemplations of life, marriage, family, legacies, love, and keeping secrets. Additionally, his old friend is a potential old flame who has written a book of comics about people who decided to not have children, which is excerpted throughout, adding a meta-commentary to the proceedings. I feel the entire narrative is mature and nuanced, aided by expert storytelling that is effective at simultaneously being evocative and subtle while also incorporating some flights of fancy. I feel that the artwork is appropriately stylized so that feelings are as muted as the coloring, and overall I was quite moved by what I read. I cannot see this book being of much interest to younger readers, but I feel that it is an excellent meditation on life, love, and finding one's place in the world. Award winning artist Julian Hanshaw created this volume. He is from the UK and is known for his prior two graphic novels The Art of Pho (also available as a motion comic) and I'm Never Coming Back. 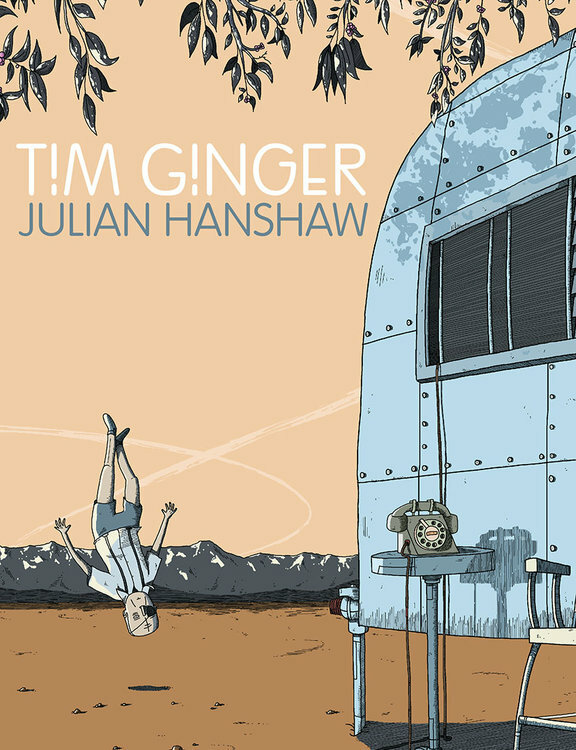 Tim Ginger is his US debut, and he speaks at length about its creation in this article. All of the reviews I have read about this book have been full of praise. Joe Gordon called it "a hugely satisfying, maturely emotional work, which gets under your skin in a quiet, calm, gentle manner." Neil Bason praised it as "deeply moving, brilliantly witty, and wonderfully written." Chris White wrote, "The story of Tim Ginger will stay with me for some time, thanks to the great writing and artwork—take a chance on this smart, funny and emotional indie comic and thank me later." 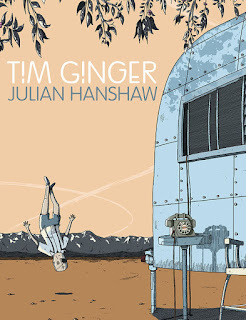 Tim Ginger was published by Top Shelf, and they provide a preview and more here. 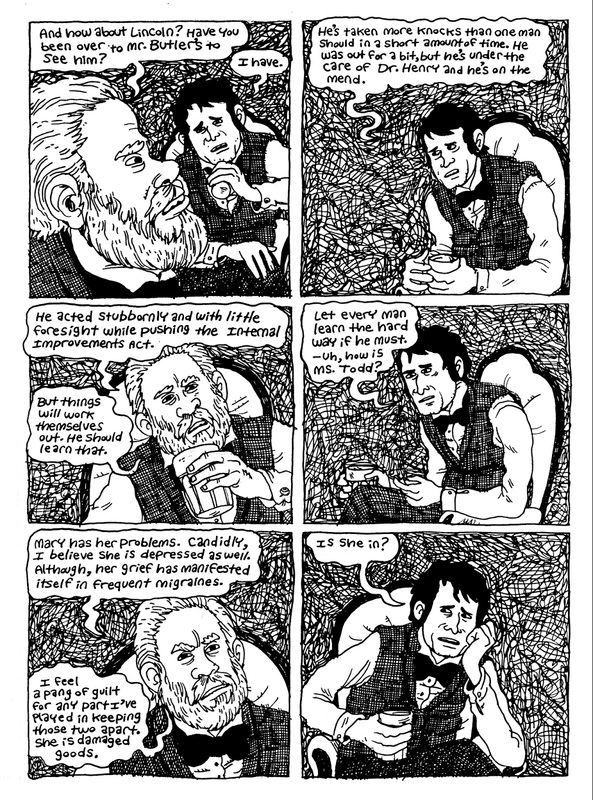 Usually, I try to be academic and critical when I review a graphic novel, but I have to tell you that this book, Fantasy Sports No. 1, made me laugh out loud at least 4 times before I even got to the main action bit. 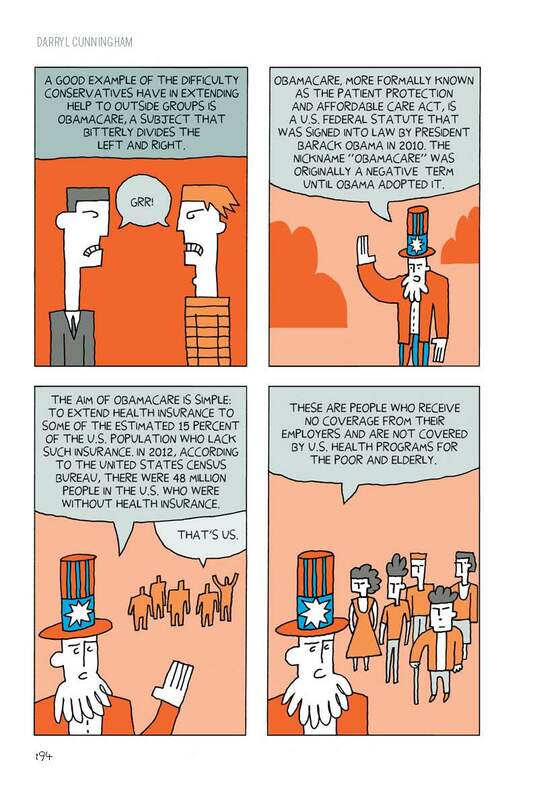 I think it's smartly written and deftly drawn. This is an energetic and exciting book that just made me want to share it with others as soon as I read it. Along with Nimona, with which it shares a couple of similar features, it is one of my favorites this year. I do not think I am spoiling much by revealing that they eventually solve the puzzle and enter a realm of the dead ruled by the mummy "He of the Giant Steps." After a very comical exchange between Mug and the mummy, a challenge is issued and the two mages find themselves involved in a battle not only for the treasures of the vault but their very lives. They have to play a cosmic game of basketball, and the mummy, despite his decrepit outward appearance, has a whole lot of game. 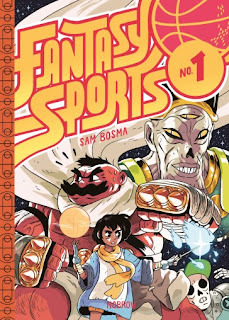 The culprit behind this fantastical and fun adventure is Sam Bosma, who first self-published Fantasy Sports in a shorter form as the comic book Fantasy Basketball. This new format features larger pages and color, and I think that the whole package is so beautiful and enjoyable. 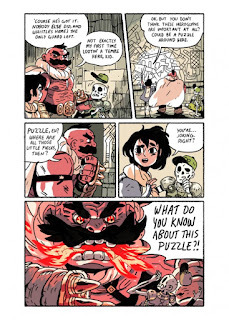 Bosma is also known for his work as an artist on the cartoon show Steven Universe. He speaks more about his work on this book and career in this interview. The worst thing I can say about this book is that I want more of it, right now. Luckily, Bosma has written that he is working on a second volume. All of the reviews I read of this book seem to share in my enthusiasm. 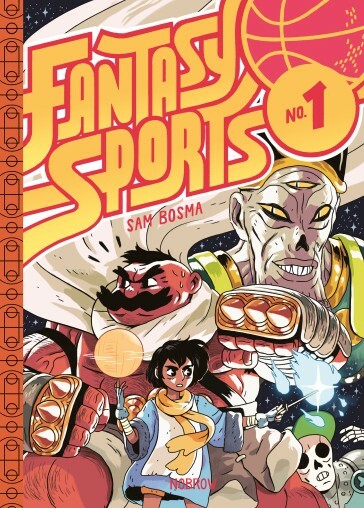 Zainab Akhtar called it "an irrepressibly fun, knowing, and breezy tale of sporting playoffs, magical mages, and surprisingly cute skeletons." Megan Kirby wrote that "the large hardcover book looks and feels great. 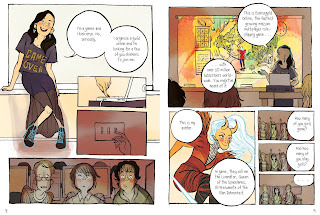 As a YA release with a standout female protagonist, it’ll hit off with readers off all ages." Richard Bruton called it "a stellar début book" and "the very definition of fast, furious fun." Fantasy Sports No. 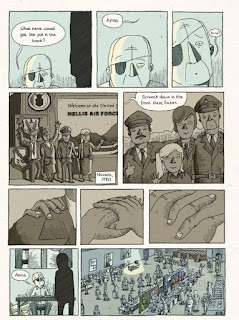 1 was published by Nobrow Press, and they have more information and some preview images available here. 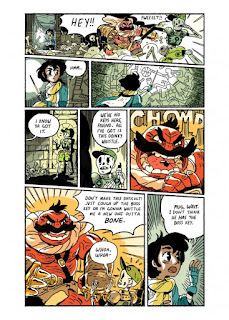 I feel that this would be a great book for older elementary or YA readers, and in the words of Bosma from his Tumblr page, "It’s funny and dumb and good for all ages as long as you’re cool with some rude ‘tude and some cartoon violence."